Usually when an opponent drops 14 threes on the Pelicans, the game is pretty much over by the third quarter. Tonight, however, the Pelicans had two things going for them that prevented a loss: Davis was getting to the line, and the whole team (and Stiemsma particularly) were controlling the glass. It was the second chance points and 10-free throw advantage that helped them weather the storm when the Hawks managed to sink 9 three-pointers without missing one starting from the end of the half to the first few minutes of the fourth. It some respects it was fortunate the Hawks are who they are. They simply didn’t get any free throws – and didn’t deserve any more than they got either. All of their guys – Millsap, Williams, Teague, Mike Scott, Elton Brand – when they got free in space they preferred to take floaters and quick mid-range pull-ups rather than attack the rim. Jump shooters don’t draw many free-throws. Davis, on the other hand, was determined to attack the rim for much of the night, opening the game with a quick face-up and go that left Millsap behend as Anthony went in for a dunk. The rest of the night wasn’t that easy for Anthony – and he kept attacking the basket with arms and legs flailing in different directions. It doesn’t have to be pretty, though. 27 points on 14 shots? Take that any day of the night. Especially with only a single turnover. 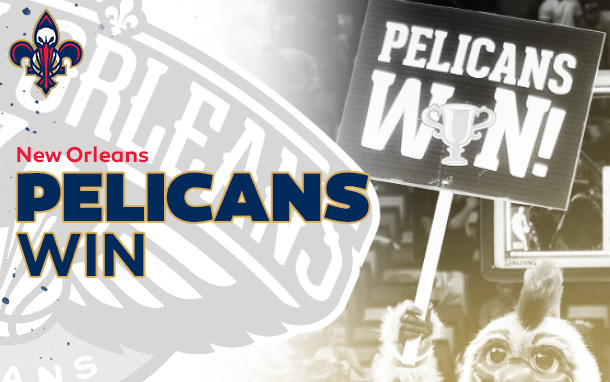 In the end, the Pelicans, missing Tyreke Evans with bruised ribs, gutted out the win, 105-100. Free smoothies? Morrow had success posting and scoring over Louis Williams in the game, and after a couple good plays, got so excited that in the fourth, he caught the ball on the wing, faked a shot, dribbled through his legs twice jab stepped, and then pulled up and jacked a long two. Airball. Anthony Morrow should probably stick to set plays and switches. He’s good at those. Brian Roberts hit a big shot at the end of the game and Anthony Davis immediately gave him a big hug. Davis was encouraging and talking to people all game long as he appears to be embracing a leadership role. Good thing Brian hit that shot – it was a tough leaner, and he’d just turned the ball over in a costly mistake that put the game within reach for the Hawks when it should not have been. All game long, Brian had good moments and some bad ones. Stiemsma is getting pretty decent at tip-outs. I can live with that. Stupid Paul Millsap. Davis kept setting him up for a block – but the wily veteran always spotted it and moved the ball. Only one block for Davis tonight. So sad. Ryan Anderson spoke during the broadcast. He’s just now starting to do shooting and other physical activities. The way he described the nerve pain he’d been feeling made me very, very glad I don’t have a herniated disk. Aminu did an excellent job hounding Kyle Korver all night and not letting him get free looks from outside. Next game is Friday against Minnesota. A win is a win and this team is growing together. Stiemsma did not seem to warrant any big praise for last night’s result. Several of the rebounds just bounced to him standing flat-footed. He did catch them and lay them back in, so there’s that. He gets scored upon so easily that I would strongly prefer Withey. Withey contests around the rim and moves his feet on defense far better than Stiemsma and Aninca. My healthy big man analysis: Davis>>>Withey>Aminu>Ajinca>Stiemsma. Aminu is a tweener who derserves time at the wing for his rebounding in addition to his big man time. I can’t do an anyslsis on our other wings because none of them will show any consistency from game to game or even half to half. If for every game we had Roberts/Morrow from last night’s econd half, Rivers from the first 3 quarters of San Antonio, Evans healthy, and Gordon from the first quarter of most games we would be a solid contender. Unfortunately we get a wholly unpredictable mess. I feel for Monty in that regard. Davis had some excellent one-on-one defense of Milsap. Not easy. Nice bounce-back game on the shooting end as well. I need for Gordon to stop jogging or standing 95% of the time, and start running to spots. Mostly on offense, but last night he dogged it when he came in to the game in the 2nd half, and gave up a corner 3 within 10 seconds. I see him trying to lead the defense vocally, but setting an example with hustle at least 75% of the time would help him earn his money. ….likes games vs the Eastern Conf!!! I agree I’d rather see Withey.